You will be given a reference e-book to read which has 1444 pages And the test will be based on that e-book , you can take final test within 1 year of purchase. What is Concrete Construction Engineering? Concrete construction engineering is an essential field of engineering which primarily covers all issues that pertain to the design and construction of pre-stressed and reinforced concrete structures. It also involves all the structural aspects and materials linked to concrete and masonry starting from the basic materials, concrete placement, properties and admixtures up to offshore structures, architectural concrete, roller-compacted concrete and automation. It should be noted that if you become a certified concrete construction engineering expert, then your tasks will involve planning and implementing concrete construction projects. You are also required to improve your expertise and understanding about all concrete properties, physics of construction and the major principles used in design. Since the scope of your work involve the designing of concrete structures, it is greatly possible that you will be hired to do projects that require constructing various concrete structures including dams, buildings, roads and bridges. As a concrete construction engineering expert, your role in all aspects linked to the whole building process starting from the conception of the design up to the process of inspecting the completed structure is very essential. You will be required to oversee project execution which mainly involves constantly interacting with building professionals, your construction workers and your clients. You will also be responsible in ensuring the safety of all concrete structures that you have built. 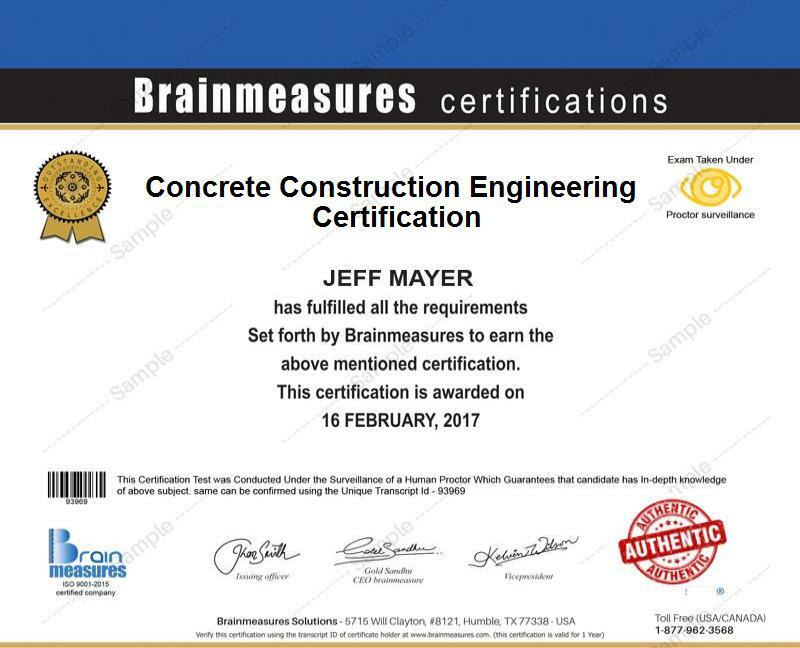 Brainmeasures concrete construction engineering certification program is the most ideal online certification program for you if you have a strong desire to become a concrete construction engineering expert. This concrete construction engineering course from Brainmeasures is truly remarkable since it works efficiently in your attempt to receive the most accurate information in this field. Deciding to enrolling in this online certification course makes it possible for you to access the company’s popular concrete construction engineering training which covers all vital aspects linked to this field including its scope, the duties and responsibilities of certified concrete construction engineers, the most recent advances in special concrete applications and engineered concrete materials like architectural concrete, how to efficiently coordinate with building professionals, your construction workers and your clients to guarantee the success of your construction project and how to stay within the specified budget when performing construction projects. The concrete construction engineering certificate that you will receive right after you complete this certification course from Brainmeasures will greatly represent your skills and knowledge in this essential engineering field. How to effectively resist abrasion? How to effectively proportion concrete mixtures? The concrete construction engineering certification program which is now available at Brainmeasures aims to strengthen the knowledge of those who wish to improve their proficiency in this specific engineering field. The program mainly targets contractors, engineers, government agency employees, concrete material suppliers and any other individuals and professionals who are greatly involved in the field of concrete construction. Your annual salary as soon as you receive your concrete construction engineering certification can also be expected to grow higher. With the presence of your concrete construction engineering certification, you will find it easier to apply for the position of a concrete construction project manager which enables you to receive around $58,000 to $117,000 per year. Working as a certified concrete construction engineer also allows you to enjoy up to $163,000 yearly.